The West Coast evokes visions of polished driftwood and raging waves, tranquil sand dunes and crimson sunsets--a savage beauty that draws visitors from around the world. Some lucky visitors, like renowned photographer Adrian Dorst, find a reason to stay. In <i>Reflections at Sandhill Creek</i> Dorst reflects upon his chosen home of thirty-five years, capturing quintessential West Coast icons in a stunning visual journey to this astonishing place--and beyond.<br /><br />Inspired by Ralph Waldo Emerson's philosophy that &quot;the world exists for the education of each man,&quot; Dorst's photography and accompanying text contemplate what can be learned by walking alone in a wild place where nature still dominates.<br /><br />Dorst's unparalleled ability to capture the beauty of his surroundings, delighting in the moods and seasons of this alluring landscape, proves that he is both a skilled photographer and a perpetual, inquisitive student of the natural world. 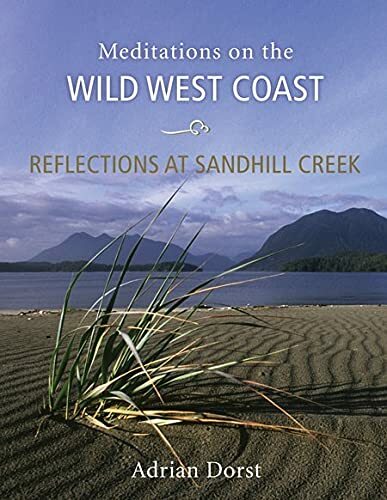 <i>Reflections at Sandhill Creek</i> will inspire those who have experienced the West Coast to take home its essence for further contemplation, and allow those who have not yet had the chance to make the journey from wherever they are. Adrian Dorst is known to many for his photographic portrayal of wilderness and wildlife. In the past two decades his work has appeared in calendars and on posters as well as in numerous magazines in Canada, the US, and Europe, among them <i>International Wildlife, BBC Wildlife</i> and <i>Canadian Geographic.</i> His photos have also been published in over fifty books including <i>Hiking with Ghosts, Paddling through Time</i> and <i>Clayoquot: On the<br />Wild Side</i>. Adrian Dorst lives in Tofino, on Vancouver Island.